Now here's a light, amusing and intelligent read, just perfect for Christmas. Lizzie plans to leave her philandering husband, Tom, once son Jasper goes to college in a few months. However, Tom leaves her, permanently, by driving her car into a quarry. 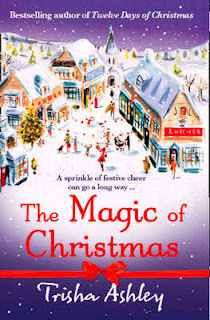 This sudden freedom doesn’t change her life as she continues cooking in competition with old flame Nick, writing her ‘Life in Recipes’ column and rehearsing for the traditional Mystery Play, that is until Tom’s girlfriends start turning up. OK. This sounds very chic-lit but it is packed full of memorable eccentric characters and is very funny, very witty and has some particularly observant description that will make you laugh. It’s also delightfully personal, as if a friend had phoned to tell you of her day. The perfect Christmas read, romance included. For my recent birthday, my sister from Perth, (down under) sent me a wonderful book. Apparently it's an Australian classic and I'd never come across it. Perhaps you all know all about it and think me an ignoramus for not doing so. Called A Fortunate Life, it's the memoir of an amazing man, A.B. (Bert) Facey who was born in Australia in 1894. He was unable to read or write till well into adulthood and his story is told in very simple language yet his life was so full, the book is a real page turner. Virtually abandoned as a young boy, he was passed from family to family, practically as a slave. He was beaten half to death by one man and carried those scars all his life. Surviving all this, he became tough and independent, virtually running farms by the time he was 12 and cattle driving across the outback at 14 (once getting lost in the bush for six days before being rescued by Aboriginal people). He worked with sheep, dug wells (and nearly died when one fell in on him) and was injured at Gallipoli and these are just a few of his many lives. 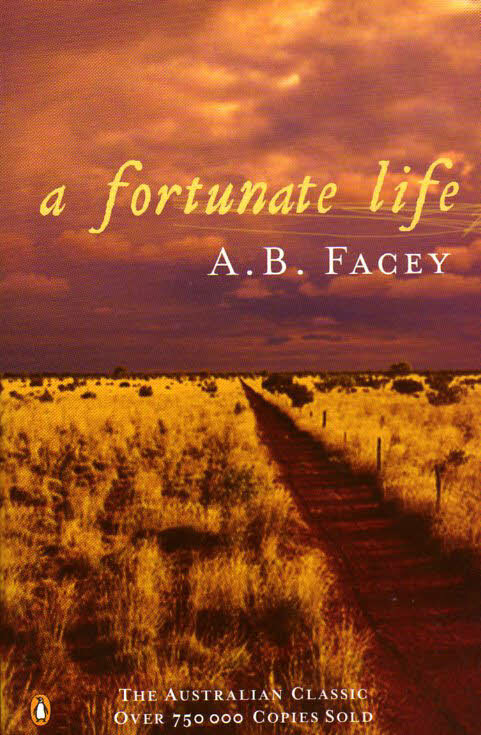 A quote on the blurb says - 'In Albert Facey's story we find a story of Australia.' and what a story! Yes, quite right. We really must get back to books. After all, we are a bookshop. Well, the book for our return from Games Workshop and Rorke's Drift is a big one. 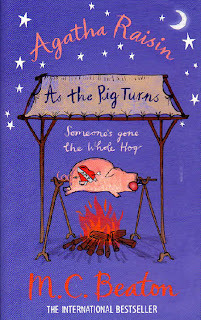 It's the 22nd Agatha Raisin title by MC Beaton and it's called Agatha Raisin As the Pig Turns. 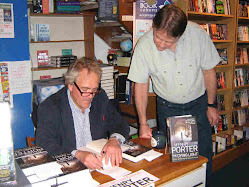 It's bound to be a big hit in Cotswold Bookstore so we received 20 copies the other day. I just love the quote from 'Entertainment Weekly'. "Agatha is like Miss Marple with a drinking problem, a pack-a-day habit and a major man lust." 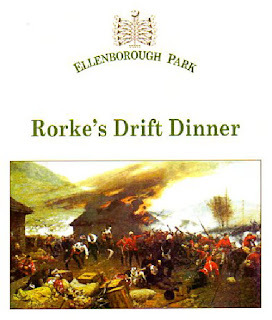 For my Birthday, my thoughtful daughter in New Zealand (I have two thoughtful daughters, one here, one there) booked for me, two places at 'An Audience with Rob Caskie' at Ellenborough Park, near Southam. That's the Southam near Prestbury, by the way, not the one on the Chipping Norton road. As my wife felt that the second ticket might be better used by someone who had an actual interest in military affairs, I took along Chris Stott, a good friend to all of us in the shop. The building itself is is quite a sight as you can see on their web site http://www.ellenboroughpark.com/ and we were greeted by the highly efficient, Laura. Unfortunately there was a minor hiccough when a member of staff decided that Stott was pronounced Stoat and passed the word round so that everyone continued to call him Mr Stoat, all evening. I got away with Keats rather than Cats or possibly Coats. Rob Caskie, could be described as the South African version of Brian Blessed without the beard though he is almost certainly closer to sanity. He has a big booming voice and was soon entrancing the audience with details of the incredible courage of the men who fought against overwhelming odds for eight hours winning 11 VCs in the process. We learned, not only the story of the battle, but also what became of many of these young soldiers (average age 23) after the survivors returned home. He also told us of the weapons used (and I was glad to be in the second row, the club Rob was waving about seemed to come rather close to the heads of the audience members sitting at the front). After his lecture,(delivered occasionally in the Zulu language) and a good round of applause from the thirty or so members of his audience, we were free to speak to the 'Corporal' who was dressed in the uniform as worn by the soldiers who fought that day. He had some of the rifles from the period and the throwing and stabbing spears of the Zulus. Again, a very knowledgeable fellow and very interesting to talk to. Then, feeling like extras on the set of Downton Abbey, we were seated around a huge table and a grand meal was served. 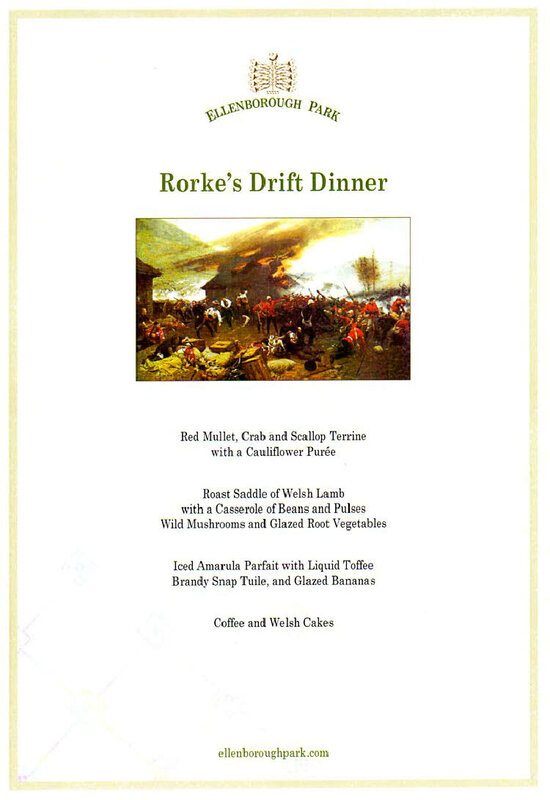 The theme was, of course, Welsh and Welsh Lamb and Welsh cakes came into it. I found myself sitting next to Douglas Bourne whose grandfather was the Colour Sergeant at Rorkes drift. (Played, in the film Zulu, by Nigel Green) Typically, he had never said anything about his exploits that day. After an illuminating and entertaining evening, Chris and I were back in Moreton in Marsh at about midnight. However, the cost of his glass of orange juice was obviously very much in Chris's mind for he called in at the shop this morning and presented me with a carton of the stuff. 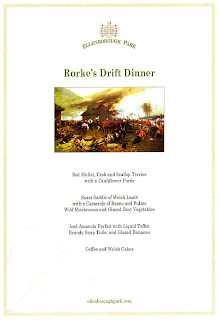 (Rob has a site at http://robcaskie.com/ and you can hear him talk of the battle by joining 'Great Guides' there. Thank you to New Zealand daughter for the tickets and to the management and staff of Ellenborough Park and, of course, Rob Caskie, for a terrific evening. There was one thing I forgot to say on yesterday's post - we also stock White Dwarf. That's the Games Workshop magazine containing advice on modelling, painting and gaming. It's a really useful monthly magazine. The photographs of some of the expertly painted miniatures, that appear every month,are incredibly detailed. 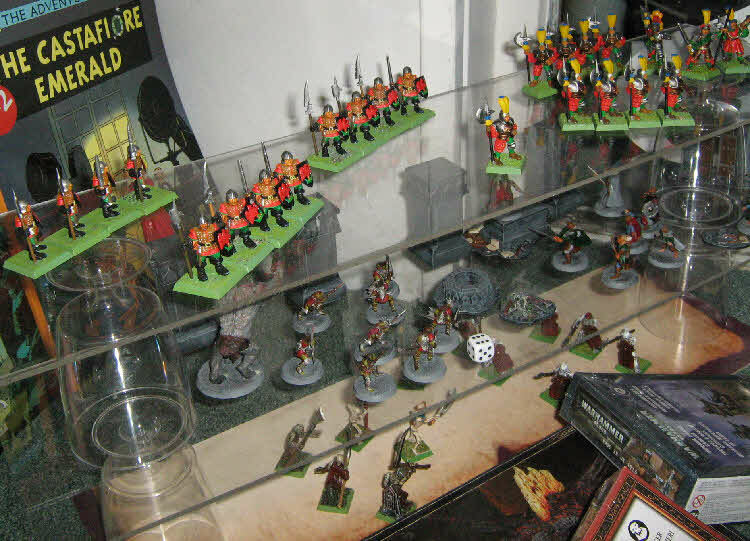 The models in the window have multiplied and on Wednesday, we hope to have representation from Warhammer 40,000. However, just in case you are wondering - yes, we still are a bookshop and we'll soon be talking about books again. And we still are a bookshop that loves dogs. 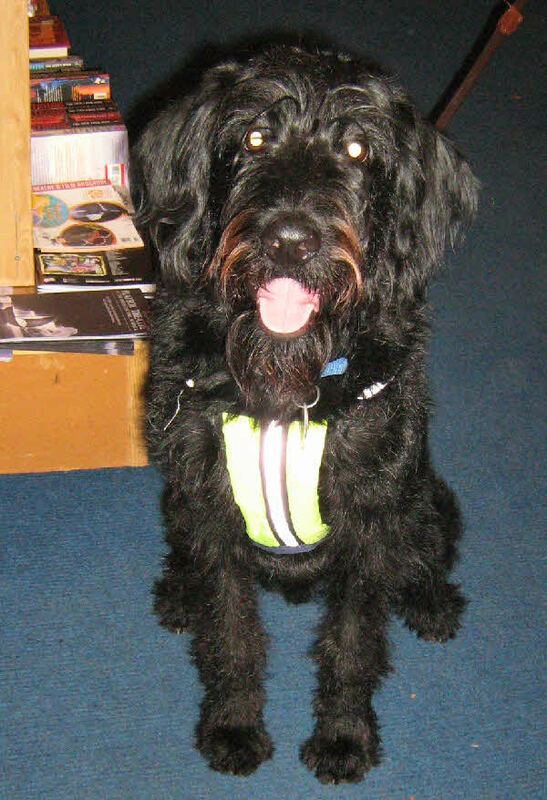 This is Hector who called in on Sunday. He's a friendly hound but don't invite him in if you own a china shop. Bulls aren't in it. Nice to meet you Hector (great name!) and thanks for bringing your folks in with you. Finally we are up and running with our new (ad)venture. 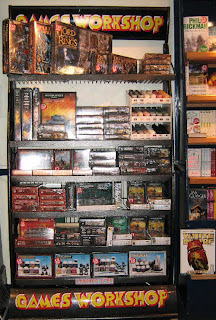 Cotswold Bookstore is now an official stockist of Games Workshop products. We have taken quite a while to decide on this venture but we like to think that many of the customers for this product, may sometimes like to buy a book too. 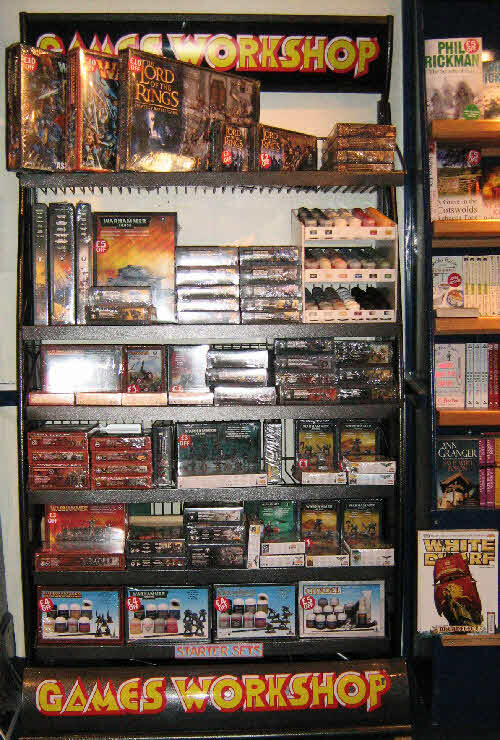 Here's the new stand, full of Games Workshop games, miniatures and paints. The three worlds are all represented, that's Warhammer, Warhammer 40,000 and Lord of the Rings. Tony is a fan of the latter, though he's into modelling and painting, rather than the actual gaming. Perhaps the prices are not visible in this photo, but we are extremely competitive, even with that minor competitor of ours - Amazon. 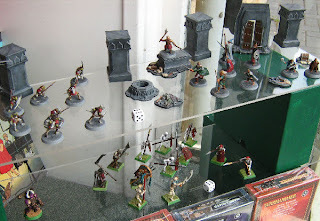 Here are some of Tony's Lord of the Rings models in our window display (top). The models below his have been loaned to us and assembled by Ben and painted by Mike. Thanks guys! This is not just a game for children. Indeed, it would be the ideal hobby for kids and Dads to share. There's a big kid inside every Dad (or Granddad, in Tony's case) and we know a good few adults who are proud of their vast armies of Space Marines, Empire Cavalry or Uruk Hai. Do pop in for a chat about this very social hobby and check out our prices. We even have a special spray-paint service for beginners. We'd also like to meet those experts among you for we could do with plenty of advice from the other side of the counter. One last thing - If you would like to see YOUR painted Games Workshop models in our window and on this blog, do call in and show us them. Preparing for a Cunning Plan. We are desperate to show off our latest cunning plan but I'll wait till the new stock arrives with its stand and then take a few photos. Meantime, David and I wrecked the shop last night and today, moving about half the books onto new shelves and bringing to light piles of ancient dust in the process. We hope, by this weekend, the new and unusual stock will have arrived and everything will be ready to roll. Our new leaflet, BOOK NEWS No 43, is nearly finished and will have news of the CP (cunning plan) in it plus reviews of 6 excellent books. We had a very interesting visitor today. Ginny Williams-Ellis called in for a book but while in the shop she told us a bit about 'Read Easy'. It's a scheme intended to help those with reading difficulties make that breakthrough that they couldn't manage earlier in life. Apparently, about one in six people have difficulty with their reading so it is a much more common problem than many non-readers realise. There's a new group being started, I believe based in Evesham. There is a site at www.readeasy.org.uk and I expect there will soon be news of a local branch there. So, if you know anyone with this problem or would like to act as a volunteer, keep an eye on that address. This was a book which I received in the post from the author herself. Now, of course, I expect she has sent out more than one copy to the owners of book shops and that her main intention has been to improve her chances of selling copies. However, I presume we might have a mutual friend for with it, she had included a hand written letter addressed to, ‘Dear Tony’, hoping that I might enjoy her book. Well, Imogen, I certainly did. Sir Hugh, second son of the Earl of Sussex, is not long returned from fighting in the American War of Independence, when a body is discovered on his land by his neighbour, the outspoken sea captain’s wife, Harriet Westerman. The reclusive Gabriel Crowther, an anatomist with an eye for detail, is soon dragged along by her into investigating the murder. 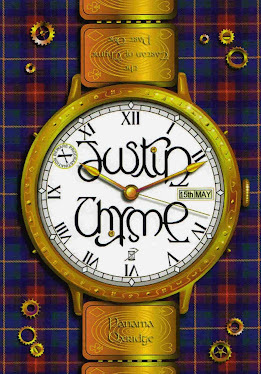 It is obvious that there is a connection to the Earl for the murdered man has, on his person, a ring showing the Thornleigh arms but it is when a second murder occurs that suspicion falls on Hugh himself. Meanwhile, in a parallel story, the heir to the estate, who has married for love and has disowned his family, is also murdered in his London house. The bodies pile up and Harriet herself is also threatened. The already dizzy pace quickens through the riotous streets of London and more dramatic deaths to a grand finale in the blazing ruin of the great house. 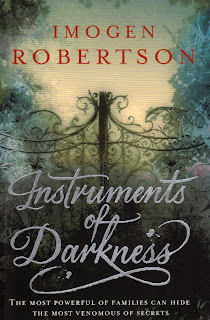 This has a complex and dramatic Dickensian plot, wit borrowed from Austen, a dark love affair out of ‘The Turn of the Screw’ and a Bronte like ending yet it is fresh and inventive throughout. The mystery is a genuine one, the relationship between the outspoken Harriet and the rather dry Crowther is always entertaining and is often very funny. The characters are vividly described and more than one could have been an escapee from Copperfield or Bleak House (the author even uses a character’s name from Nicholas Nickleby) The contrasting settings of country houses and grand manners with the rabble in the streets of London during anti Catholic riots are both perfectly described, the one all manners and wit, the other foolishness and fear. In short, I was happy to receive this book from Impogen, and even happier to read it. A thoroughly entertaining piece of work with two of the most interesting ‘detectives’ in fiction. I look forward to reading the next in the series, Anatomy of Murder, and we now stock both. Michelle Paver's 'Chronicles of Ancient Darkness' was a huge hit with our younger readers right from the first book, Wolf Brother. 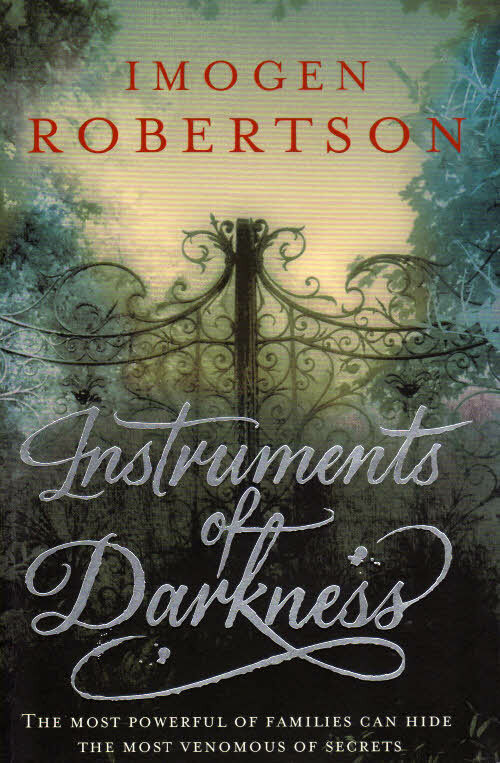 The quality of the series was confirmed when she won the Guardian Children's Fiction Prize with the sixth in the series, Ghost Hunter. 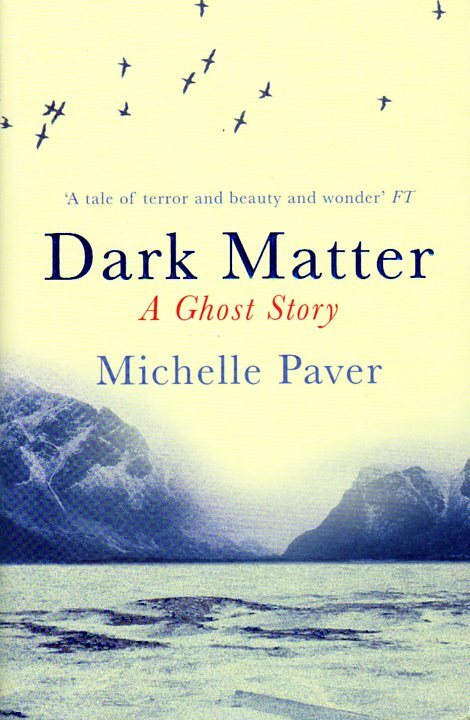 We 'reviewed' her adult title, Dark Matter, when it was in hardback a year ago but now it's a reasonably priced paperback, we thought more people aught to know about it. When poverty forces Jack, a rather insular young man, to volunteer as one member of a three man team at an isolated weather station in the Arctic, he believes his main problem may be how to rub along with the other two who are of a different class and lifelong friends. However, it soon becomes apparent that there is another presence out there in the long northern night. When, because of an accident to one of his companions, he is left on his own, his nightmare begins and unlike Ghost Hunter, here it's not the ghost who is hunted, but Jack. 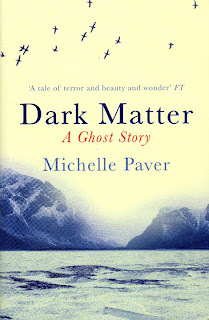 Told in diary form, this adult ghost story uses many tricks of the trade but uses them well. It has echoes of The Woman in Black in its claustrophobic isolation, but no harm there. It is its own story and expertly told by this author who knows the Arctic well.